The Kaiser murdered Theodosia’s mother, the Fire Queen, when Theo was only six. He took her country and kept her prisoner, crowning her Ash Princess – a pet to toy with and humiliate for ten long years. That era has ended. The Kaiser thought his prisoner weak and defenceless. He didn’t realise that a sharp mind is the deadliest weapon. 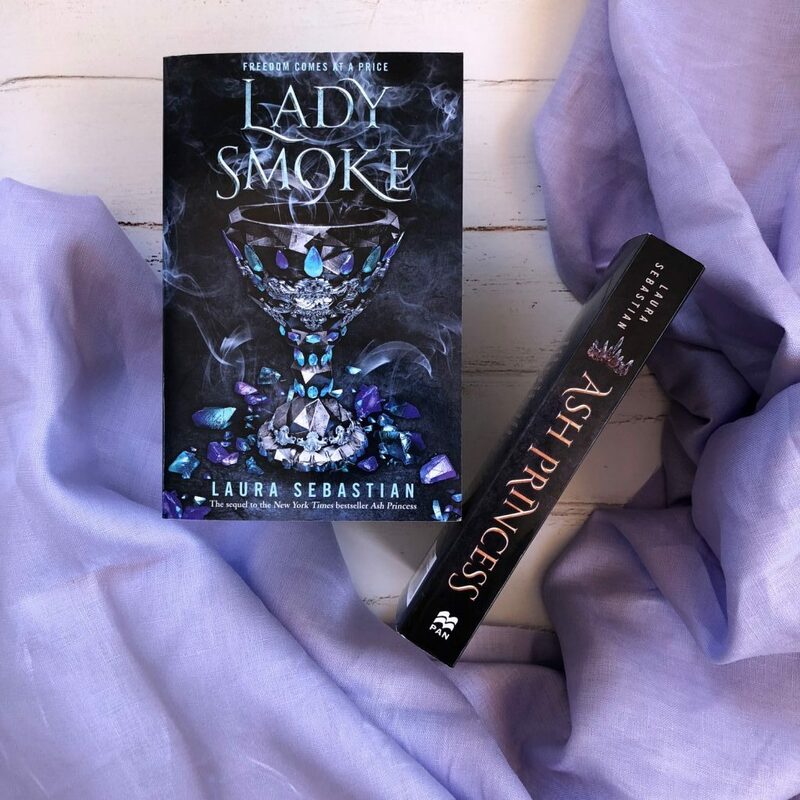 Lady Smoke is the sequel to Ash Princess and the second book in this new fantasy series from US author Laura Sebastian. You can read my review of Ash Princess on the blog HERE. Lady Smoke picks up immediately after the conclusion of Ash Princess — Queen Theodosia has escaped the Kaiser’s imprisonment in Astrea, seeking refuge and alliance with her aunt, the famed pirate Dragonsbane. Theo is accompanied by her Shadows — Blaise, Artemisia and Heron —aboard a ship captained by Dragonsbane. Soren, the Kalovaxian prince, is in their custody. Theo knows she’ll need allies to retake her kingdom from the conquering Kalovaxians and free her people, who are still enslaved by the Kaiser and his new wife Cress. So Theo aligns with the manipulative Dragonsbane and along with her fleet, they seek refuge in Sta’Crivero with King Etristo. Eligible suitors from all other countries arrive at a grand invitational to meet Theo and offer her their hand in marriage. With a husband, Theo can acquire an army and take back her throne in Astrea. The series maintains the POV from Theo’s perspective, allowing readers a deeper dive into her mindset and her emotions. She immerses herself in political issues and takes it upon herself to learn more and more about the world she lives in, so she’ll know how best to rule her people when she reclaims her throne. This first person narration also helps give the story a stronger sense of urgency, propelling the story forward and keeping the reader engaged. I would’ve loved a little more involvement with Cress. She was a major character in Ash Princess, and we don’t see her again until the end of Lady Smoke. And she’s really changed. She’s powerful, ballsy, confident and a really scary antagonist. I can’t wait to see more of her in the next book. The ending of the book is very satisfying. Alliances are broken and some are strengthened. Major characters are defeated or saved by unlikely circumstances, and the pacing is quickened to keep the reader engaged. Lady Smoke delivers an amazing sequel, with heightened stakes and three-dimensional characters that help drive the story forward. This book exceeded all of my expectations and Laura Sebastian has delivered something really fantastic. I remember feeling that Ash Princess was generic and not too dissimilar to other fantasy books, but Lady Smoke took the series in a completely different direction and I really enjoyed the journey. I’m looking forward to the third and final instalment in 2020.